Now, as anyone who bakes will tell you, the kind and quality of dark chocolate you use will have an impact on the taste of the finished product. Thanks to Gail at Green & Blacks among others, I discovered that if you use a higher percentage chocolate bar you have to replace the missing fat with something else like butter. That means tempting as it may be to use a 85% cocoa chocolate bar, you need to stick with the 70% bars on the market. Choosing a fair-trade, ethical chocolate is even better so choose Divine or Green & Blacks when you cook or look further afield to Chocolate and Love or the Chocolate Cafe. In the US and can’t easily access these great brands? Askinosie chocolate is one of my favourite bean to bar producers. And now to the baking! To start with, I like to make sure I have everything to pile all the ingredients on the counter, a chair, or wherever. Here you can see I need to clean the counter and perhaps clear some of the clutter from the counter (to where I always ask myself…) but I mostly have everything. I lack vanilla extract and so have to settle for vanilla essence. Not the same but needs must. 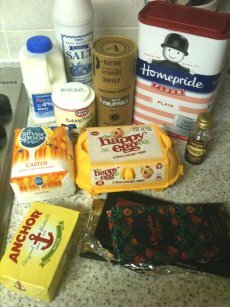 Now, I know I have to do more with these ingredients then the instructions suggest so I’m preparing to do battle… TO THE LIST! You’ll notice that I have something called American Muffin cases. These are apparently deeper but I’ve never use anything else in the last 12 years so I’m not sure whether that’s an important distinction or not. Anyway – use these to line your tin – 12 of them! As always, you need to preheat the oven. This time, interestingly, we’re using a 170C heat for our oven cooking temperature. Lack of gas oven means I can’t simply give up on life and shove my head in so I might as well make these muffins. Put the eggs and sugar in one bowl, beat the egg into the sugar. I like to beat the egg first in one area of the owl then mix into the sugar. Do this until the two are well combined and turned a light yellow colour. In a different bowl (now now – don’t mix yet! 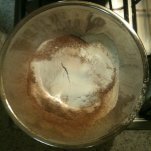 Impatient lot you are…) sift together the cocoa powder, flour, and baking powder then add the pinch of salt. Now, before we go any further, get a pan of water simmering on the stove and a bowl on top of it – not touching the water – and place the butter in it. We’re melting the butter first, chocolate second. It’s OK to reverse it and I have but you have to whisk more if you reverse it as I did. 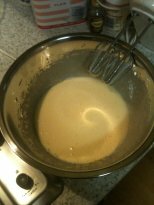 Now you have the butter melting, measure your milk and add the vanilla extract to it. Take the powder and the milk and alternatively add this to the sugar and egg mixture, mixing it carefully but perhaps not with the hand mixer as I did (and ended up with a flour explosion). Blend in bit by bit, adding milk and flour alternatively. Once finished keep blending until flour is mixed in. Your butter should be almost or completely melted now. Break the chocolate into smallish chunks (or the squares they come in) and add these slowly to the butter until all 120g are added. 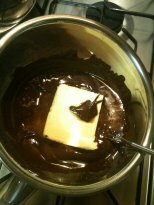 Now keep mixing the chocolate in the melted butter with a small whisk or a fork until everything is melted and blended together. Once out they should be allowed to cool slightly before eating. I found them pleasantly chocolaty but they had a very crumbly consistency and I was frequently annoyed at how quickly they crumbled. Annoying but still delicious! I must add, I have used 85% cocoa dark chocolate in a cake recipe that originally called for 70% and it worked absolutely beautifully! I didn’t add any additional fat at all. It was magic! I’m with Kavey, I often use 85% chocolat and am not a fan of sticking to hard and fast rules / recipes. Your muffins do look good and I’d certainly love to have one right now. Guessing you meant 120g of chocolate rather than 12 though? I made these yesterday….OMG delicious! So moist and chocolatey! I just had one again today and they are still amazing. I followed the exact recipe but swapped plain flour and baking powder to the same quantity of self raising flour. Make these!!! !